I have finally done something in that cross section of comics/teaching/learning/process/nerdy/insane in which I desire to live. I have written a Study Hall Guide for ETERNAL, and you can buy the digital copy right here! 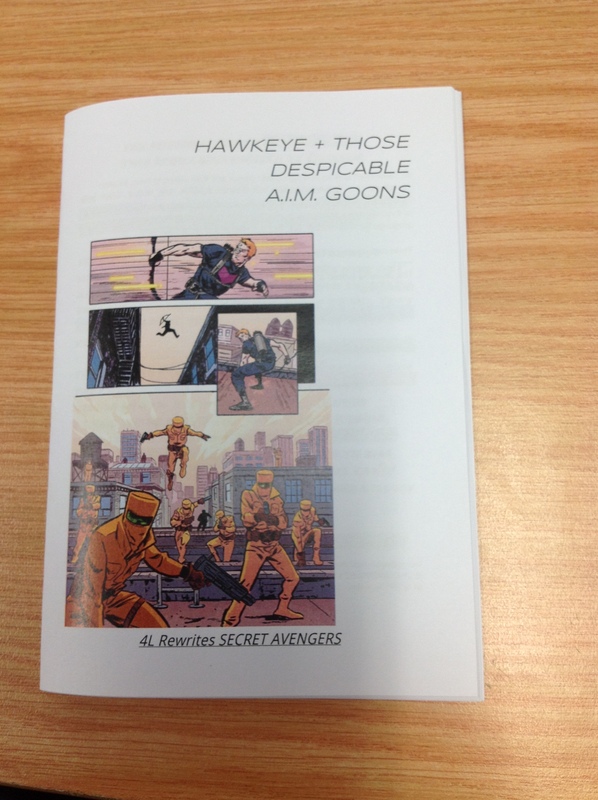 This guide helps you unpack the comic I created with Eric Zawadzki, Dee Cunniffe, Courtney Menard, and Dan Hill through Black Mask earlier this year. 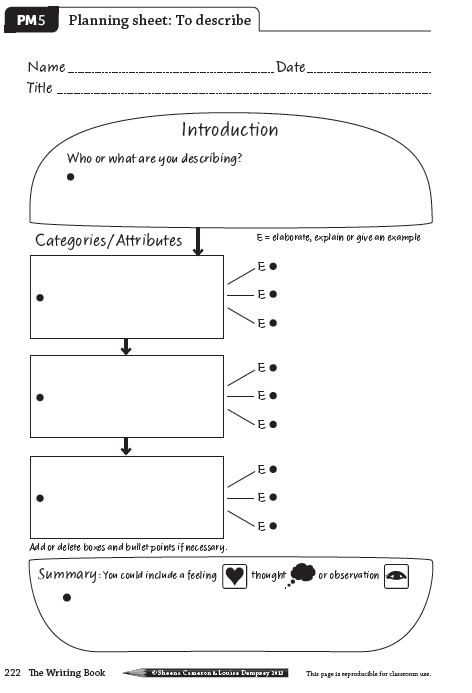 I want it to be used by teachers, but also by interested readers, and by people who want to write and are considering how much thematic stuff to layer into their work. I’ve really enjoyed making this study guide, and there will plenty more to come. Hold onto your butts, because we aren’t finished delving into the curriculum of comics just yet. But I hope you’ll start with me here, and maybe have a little educational fun. Take a single page of comics you love and rewrite it as a prose narrative. This is a simple activity but one that you’ll find draws together myriad skills involving literature analysis, image to word synthesis, and great language exploration. It’s also crazy fun to do. You can do this with a class [I’ve done it successfully with kids aged about 8 and up] and you can also do it yourself for fun or to hone your writing craft. All you need is a quality page of comics. Be sure to pick something you know will translate well to prose [and easily depending on the class you are instructing]. Also try to pick something moody, something rife to describe. The idea is that in writing the prose you describe the scene in detail [using figurative language and turns of phrase for effect] and you also get into the characters’ heads. This can be done in books, on printed line sheets, and the example I’ll give below uses Google Drive for the classroom. 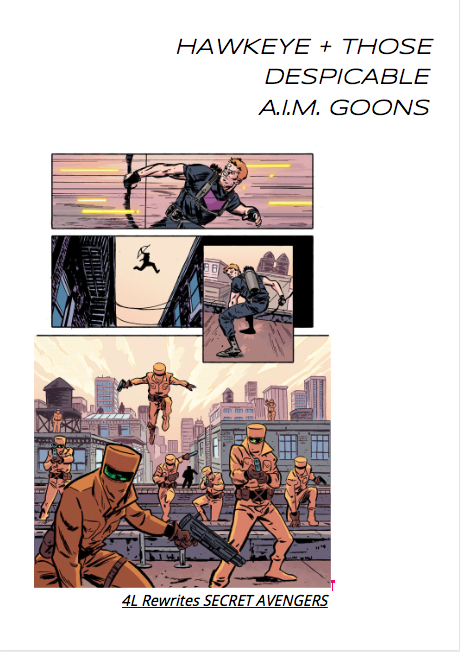 I selected a page from SECRET AVENGERS #1 with art by Michael Walsh and colours by Jordie Bellaire. I picked this page because it’s got pace, it’s relatively simple [yet with room to take it places], and it has a start [in media res] and an end moment [cliffhanger]. I had each student type their prose version of this page in a shared folder so I could easily access them all, and they could access each others’. You can then print your booklet off and fold it. I staple it with a special turning stapler that can do book spines a mate of mine located in Japan for me. And once this is done, you have a resource for your classroom, and your kids will feel ‘published’ [and they’ll be paid like they are too – #womp]. But it’s something they can share, cherish, learn from, and it looks great in the spinner rack up the back of the room. You can also set this as a writing warm up gig for yourself by getting a warchest of quality comic pages that suit your writing style [or don’t, if you feel like growing] and you set yourself 5 minutes to rewrite one. Maybe do one a week and at the end of a year put them into a booklet like this – comic page on the left, your prose reinterpretation on the right – and see what comes of it. Anything that gets you writing, stretches your brain out, makes you push, has a deadline, and you enjoy is always going to help whether you are a tween student exploring language and its practical and emotional uses or a thirty-something writer climbing the sheer cliff face of writing one precarious handhold at a time. This looks bad. I know. 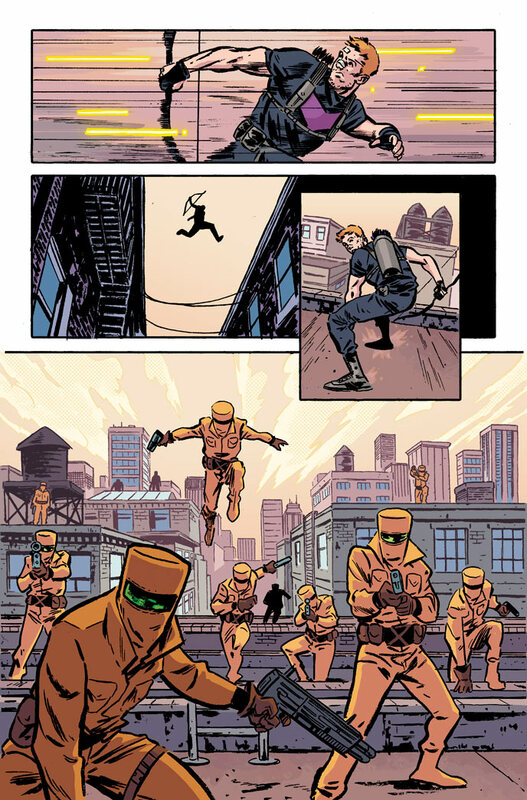 Lasers whistle by like broken radios and Clint Barton sprints like he can beat them. Hint: he can’t. He never can. Clint is the world’s unluckiest man. Or the world’s worst superhero. Ask him once a day for a week and get seven different answers, with twenty one varied [though universally lame] excuses. He sails over the gap between buildings – because he’s always been good at doing recklessly silly things. Usually for fun, sometimes to save the world. It’s a Sunday morning and the sun is rising. Most people are on the street buying bagels and reading the latest Calvin & Hobbes. They have no idea what’s about to transpire above them. A slew of underpaid and over-important henchmen from A.I.M. [Advanced Idea Mechanics] float, preen, and posture behind Clint. They might be fools but that uniform still looks good today. Clint thinks about Kate on the West Coast and then stops. He’s got things to do right now. He momentarily pauses, an itch on his ear, and one of the henchman coughs. Clint is mostly certain the boomerang arrow is the third one in the quiver. And that’s the comic rewriting activity. I hope it finds you well. I’ll try to collate and share some sample comic pages on here soon.